Cook pasta as package directs, rinse, drain and place in a medium mixing bowl. Cook the carrots in boiling water for 1 to 2 minutes, remove, and rinse under cold water to set the color. Add to pasta. 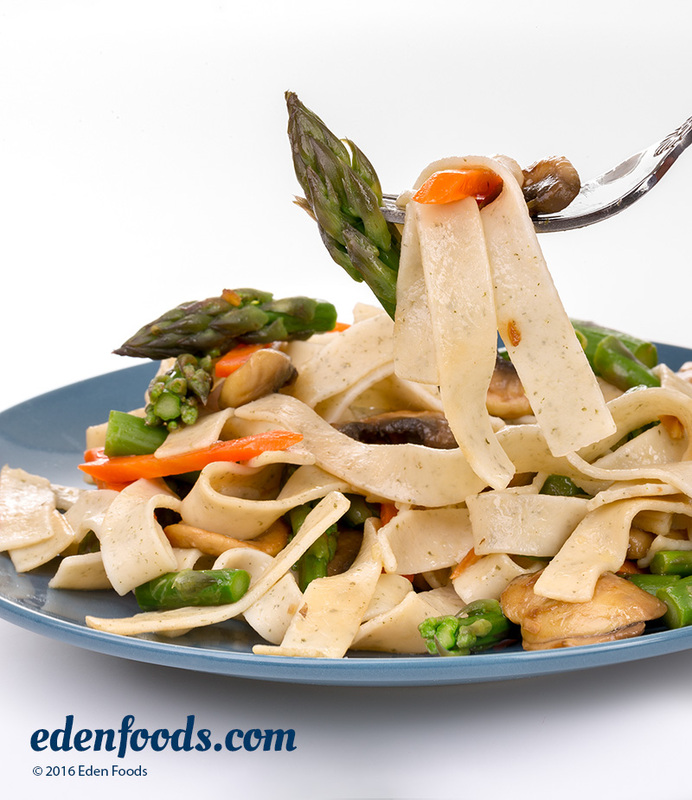 Cook asparagus in boiling water for 3 to 5 minutes until tender, rinse under cold water to set color, and place in the mixing bowl with pasta and carrots. Add half of the oil and shoyu, and all of the lemon juice. Heat remaining oil in a skillet and add the garlic, mushrooms, and remaining shoyu. Sauté 3 to 4 minutes until mushrooms are browned. Add mushrooms and garlic to mixing bowl. Adjust the seasoning with a pinch of salt if desire. Gently toss to mix. Variation: 3 to 4 cups of small blanched broccoli florets may be substituted for asparagus.